WOW! Women On Writing Blog: Linda K. Hubalek, author of the Trail of Thread book series, launches her blog tour! Linda K. Hubalek, author of the Trail of Thread book series, launches her blog tour! Linda Hubalek's sixth grade teacher assigned her to write the traditional paper on what she wanted to be when she grew up, but Linda had an untraditional answer. She didn't want to be a nurse, teacher, or mom. She wanted to be a farmer! Her dream came true when she graduated from Kansas State University with a degree in Agriculture/Horticulture, and went on to spend years doing agronomy research, and eventually started her own business, Prairie Flower Creations. Much like her own ancestors who headed West, Linda found herself in California tending a cement garden and longing for the fields of Kansas. Lind "visited" her beloved Kansas by writing the Trail of Thread series about Kansas pioneer women. 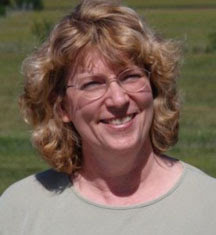 Although Linda is back in Kansas (growing bison this time, not prairie flowers), she's still writing about Kansas women. Her fourth series, the Kansas Quilter series, will be released later this year. The Trail of Thread series includes three books based on the lives of the author's ancestors. Each book, told from the viewpoint of a pioneer woman through letters she writes to those "back home," tells the tale of a family moving from the settled East to the wilds of the newly opened territory of Kansas in the mid 1850s. The first book, Trail of Thread, tells of life on the trail West as a family makes the cross country journey from Kentucky to Kansas. The second book, Thimble of Soil, is the story of a widow and her children traveling from Ohio to Kansas and trying to establish a home amidst the skirmishes that riddled Kansas, as the slave state and free state supporters battled over the fate of the Kansas territory. The last book, Stitch of Courage, takes place during the Civil War years and tells of the marriage between the two families portrayed in books one and two and how the war was fought in the West. These books are written in letter form, covering the years 1854 to 1865. Twelve quilt patterns are featured in each book of this series. The books are available as ebooks for Amazon's Kindle, Barnes & Noble's Nook, or for Kobobook's Kobo. You can also order autographed paperback books through BisonFarmGiftShop.com. Book Giveaway Contest: If you'd like to win the Trail of Thread series (3 Kindle eBooks), please leave a comment at the end of this post to be entered in a random drawing. For an extra entry, link to this post on Twitter with the hashtag #TrailofThread, then come back and leave us a link to your tweet. The giveaway contest closes this Thursday, May 12th at 11:59 PM, PST. We will announce the winner in the comments section of this post the following day, Friday May 13th. Good luck! WOW: You based your Trail of Thread series on your own genealogy. How did you come to decide to write historical fiction based on your ancestors? Linda: Writing was not my career choice when pursuing my college education. My degree is in horticulture from Kansas State University and I first worked as an agronomy researcher before starting my own wholesale flower business in the 1980s. But I had to make major life changes when my husband’s job transferred us to California for a two-year project. I sold my business and all of a sudden I was without a job and an identity while trying to adjust from rural life to big city living. I went to a local community college after we moved and took a course on “What to do with the rest of my life.” When making a list of goals and dreams for that class, I remembered a visit to my late great grandparents’ homestead in 1983. It had been such a sad occasion that I had vowed to write a book about my great grandmother Kizzie Pieratt someday. This vow, along with being homesick for my family and our quiet life in the Midwest, gave me the inspiration to write about my ancestors and the land they homesteaded. My book first sold in my hometown of Lindsborg, Kansas (a tourist town known as Little Sweden USA) and tourists bought it, read it, and called me—wanting to know what happened to the family. I ended up writing four books for my Butter in the Well series and that started my new career in writing. In my second series, Trail of Thread, I followed my maternal ancestors who traveled to Lawrence, Kansas in the 1850s. These three books relieve the turbulent times the pioneer women faced before and during the Civil War. Planting Dreams, my third series, portrays my great-great-grandmother Charlotta Johnson, who left Sweden in 1868 to find land in America. These three books trace my family’s journey to Kansas and the homesteading of their farm. Recently I formatted and published my original ten books into eBooks and I have been marketing them to a whole new audience of readers. Linda: Luckily, because my book series have been based on real people, old photos of the actual character, or someone in the next generation, have given me a hint of their physical looks. Finding facts and hearing stories of these people have also helped form my characters’ personalities. But if I have no photo to look at—as can happen with minor characters—I go with the situations that make up their lives. I also make lists of the time span, with what year each character was born so I can keep everyone straight in relationship to the time frame I’m working in. WOW: Why do you write your stories in series of three smaller books instead of one novel? WOW: Good marketing point! You began self-publishing your books in 1994, before it became a popular and acceptable thing to do. Tell us a little about your decision to self-publish. Linda: I wanted to see my books in print so I decided to learn the process and do it myself versus taking the time to submit and hope that someone else would publish it. Through my company, Butterfield Books Inc., I have control over the rights and can keep the books in print forever. WOW: What is involved in setting up your own publishing company? Linda: Start with the Small Business Administration’s website at www.SBA.gov. If you are going to start a publishing company you need to see what all is involved in starting a business first. Lots of thought and planning needs to go into this before you even apply for licenses and tax ID numbers. Next you need to check with your state (and city) to see what rules and regulations you have to do for them. THEN you search “how to start a publishing company” to see all the steps required to actually get your book edited, designed, printed, and marketed. Look through published books to see what is on its copyright page. Search on the internet on “How to get an ISBN,” etc. to find the right agency to register your book’s information. Of course there is a big difference depending on if you’re going to print a book or just post it online as an ebook, but you still need to have a business plan and the proper licenses in place to protect both you and your work. WOW: Once you have your company up and running, how do you market your books? I published my first books before the Internet really started, so I sent news releases, books out for reviews, local book signings...all by mail and in person. Nowadays, besides being able to email everything, there are “how-tos” on the internet to guide you through the process. BUT, you still need the excitement of one reader to tell another reader to get the word out about your book. Be it in person, or through social media—“word of mouth” is the best way to promote your book. And, you need a good book for it to even be talked about, so be sure to have it read and edited by an outside party to polish the book to its best potential. WOW: Yes, professional editing and formatting is essential and well worth the cost. What would you say are the pros and cons to publishing on your own label? Linda: You are in control, so all decisions, good or bad fall on you, or who you hire to help you. It’s a big commitment to follow through to get your book published and to stay available for the potential life of the book. WOW: That is a good point, to stay available and continually market your book instead of just allowing it one run. Looking back on your journey, what advice would you most like to share with other writer’s? For some reason, even though I didn’t major in writing in college, I have a special talent in writing history. I put the reader in the shoes of the main character, and they feel the happiness, despair, and every other emotion, right along with the homesteader in the story. I use my gift to write history in a way a reader can learn and appreciate what their ancestors did for them. And so my advice is to go with your passion of telling a story for others to read. But remember, you—or someone else that you have to find—must take the next step to getting it published. WOW: Thank you for sharing those thoughts with us. What is your next project? Linda: Now I’m finally researching and writing the book about my great grandmother Kizzie Pieratt who has been on my mind for almost 30 years. Her life story will be portrayed in the Kansas Quilter series. WOW: That’s wonderful! Congratulations on another series. Join Linda on her tour! Check out these dates and mark your calendar. You can also snag a copy of WOW's Events Calendar HERE. May 10, Tuesday @ Writers Inspired: Learn about "Writing Fiction Based on Factual Events" from historical fiction auithor Linda K. Hubalek. You can also win an ebook from Linda's first series about pioneer women, Trail of Thread. May 12, Thursday @ Aunt Pitty Pat's: Have you ever wondered about the life of pioneer women? Linda K. Hubalek, author of four historical fiction series about pioneer women, will be giving readers the facts. She'll also be giving away an ebook of Trail of Thread, a book about Kansas, quilting, and family. May 13, Friday @ Fresh Fiction: Stop by today to learn a bit more about historical novelist Linda Hubalek and enter to win a copy of Trail of Thread! May 16, Monday @ Lori's Reading Corner: Stop by for a surprise guest post and the chance to win an ebook from Linda's Trail of Thread series. May 18, Wednesday @ Cathy C.'s Hall of Fame: Will you inspire your descendants? Historical novelist Linda Hubalek writes about how her ancestors inspired her series Trail of Thread and gives away an e-copy! May 19, Thursday @ The Book Tree: Stop by for a book review of Trail of Thread today! May 23, Monday @ Caroline Clemmons: Caroline reviews Trail of Thread by Linda K. Hubalek today. But don't forget to come back on Wednesday for an interview and a chance to win one of her books! May 24, Tuesday @ Quilting Gallery: Linda tells us about how quilting is intertwined in her historical series. She's also giving away an e-copy of Trail of Thread. May 25, Wednesday @ Caroline Clemmons: Stop by for an interview with historical fiction author Linda Hubalek and a chance to win an e-copy of her book! June 2, Thursday @ Books, Books, The Magical Fruit: Learn more about Linda Hubalek, author of the Trail of Thread historical series, as well as three other historical series. Also, enter to win an ebook copy of Trail of Thread. 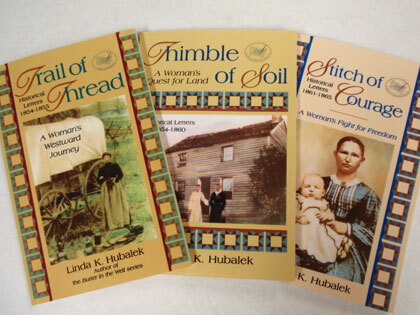 Book Giveaway Contest: Enter to win a ebook copies of Linda K. Hubalek's Trail of Thread historical series! 1. For your first entry, just leave a comment on this post! Leave a comment or ask Linda a question, to be entered in a random drawing. 2. For an extra entry, link to this post on Twitter with the hashtag #TrailofThread, then come back and leave us a link to your tweet. The giveaway contest closes this Thursday, May 12th at 11:59 PM, PST. We will announce the winner in the comments section of this post the following day, Friday May 13th, and if we have the winner's email address from the comments section or profile, we will also notify the winner via email. Good luck! This series sounds like a great read to relax with this summer. I'll be adding it to my reading list. Thanks. Love your story of success and yur unconventional life path. How is the easiest way to do historical resarch from home? Thanks again! Thanks for being the first to make comments on my book series! Yep, I'm not your typical writer and publisher...and you'll find out more about me and my books throughout this blog tour. Because you said you like series, please start with the first book of the series and you'll be hooked to read the rest, and then move on to my other two series "Butter in the Well" (four books,- which includes a cookbook of old time recipes) and "Planting Dreams" (3 books). Many thanks for joining me on the Kansas prairie! I really enjoy reading about this period of time in history! You asked "How is the easiest way to do historical resarch from home?" Luckily these days its through a computer and the internet. And don't forget your local library that can hook you up with your state's interlibrary loan service. Doesn't matter if you're "out on the prairie" like me, or in a 15th floor apartment- everyone can reach out and find out more about the past. And don't forget to talk to relatives. They may have the best and most important facts to tell you with just a few questions from you to get the conversation rolling. And ask for old photos too! Be sure to read my post tomorrow on http://writerinspired.wordpress.com/ to see how an old photo told a story. What a great concept for your book as well as a tribute to the people who helped settle this country. The titles alone have me itching to read them! I didn't have a game plan when writing the first book, "Butter in the Well" but then readers wanted to hear "the rest of the story" about the family, so I continued writing. When I was ready to start my next series, Trail of Thread, I needed a theme and titles that caught the readers eye and attention. So I came up with a concept and outline, then divided the ideas and research into thirds so I had three books to write. Everybody has their own way of writing and putting the story together... and that's part of the fun! This has been one of my dreams, as well. Born, raised and educated in Illinois, I have lived all over the world since then without returning to the Midwest. You've done a wonderful thing by putting your Midwest life into the written word! Thank you! I really enjoyed your interview, and look forward to reading your books. They are a "must read" for me. Thank you! Thanks to everyone for your comments. Please follow me this month on my blog tour as I post stories and pictures about the pioneer women on the "Trail of Thread"! My favorite era and my favorite hobby--sign me up!! These books sound great! Loved the interview questions! I can't wait to read your books, whether I win or not! I still wonder how I missed them! Thanks for the links and can't wait to read more! I really liked reading your interview. Quilting is not only my hobby, but my job. Reading and writing come in on the heels of quilting. I'll read your books as they seem to be "right up my alley"! We held a random drawing for The Trail of Thread series by Linda Hublek, and the winner is... Lucy Jones! Congratulations, Lucy! Please contact us at blogtour@wow-womenonwriting.com so we can get your email address and info we need to send you Kindle copies of the series from Amazon. For everyone else: be sure to check out the other stops on the tour for more giveaways and lively discussions from Linda.